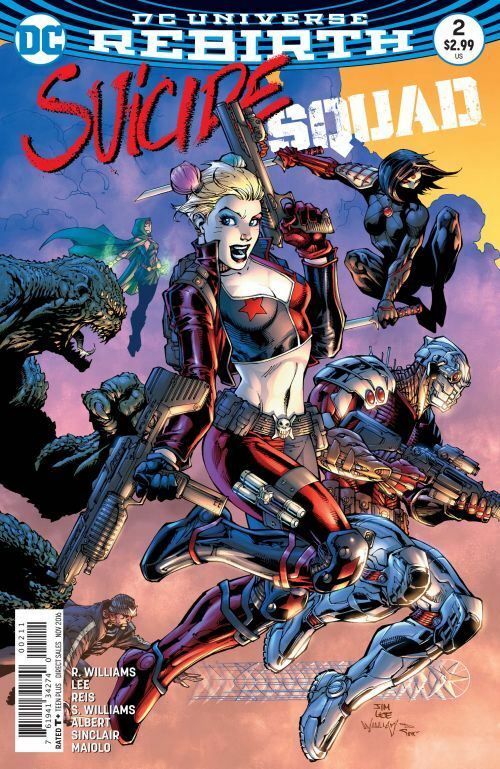 Rob Williams and Jim Lee keep the actions fast and furious in Suicide Squad 2, as the team survive their descent into Russia, and manage to find the mysterious cosmic item that is their goal. A couple of new characters get introduced into the strip in this issue. Amanda Waller finds herself dealing with Harcourt, a woman from the NSA who claims to be a fan of Waller’s. We don’t find out much about Harcourt in this story, but she is clearly being set up to give Amanda someone to deal with on her own playing field. And in the field (or rather, in the secret Russian facility), the Squad join forces with Hack. This character isn’t too clearly defined yet. She seems awfully peppy for a potential Suicide Squad member. But she does have some impressive powers, which include digitizing the entire team to move them into a sealed vault. Her name implies some other computer abilities, and this sort of makes her take the roles of both Oracle and Nightshade from the classic Ostrander team. Oh, not going to spoil that surprise. Croc once again almost steals the show with his digestive problems, but for me the best sequence involved Harley Quinn and Katana taking out a horde of Russian soldiers, as Harley tries to chat with Katana at the same time. It’s funny, with great art on the fight scenes, and works beautifully and easily to develop Katana. On the down side, Enchantress spends this issue, like the last one, not really doing much of anything. I assume she will have some extremely important role later in this story arc. Right now she is just filler. Oh, not going to spoil that surprise, either. This issue also contains a back-up story, centring on Captain Boomerang, with some really lovely art by Ivan Reis. Captain Boomerang relates his origin to Amanda Waller, but it’s nothing like any origin story we have ever read for the character. This version makes Boomerang nothing short of an Australian James Bond, and the adventure is so far over the top that you simply have to love it. Not that you have to believe a word of it. It’s not like Amanda Waller does. Only one detail sounds believable to her, and it’s the one detail that harmonizes with the established origin of the character. Seeing the very young Digger Harkness sitting in the dusty street of his small outback town, carving boomerangs and hoping his missing father will one day come back. Reis makes this panel just heart breaking. Too much of it would have made the story sappy, but as it is, it’s the perfect note to contrast with the rest of the tale.